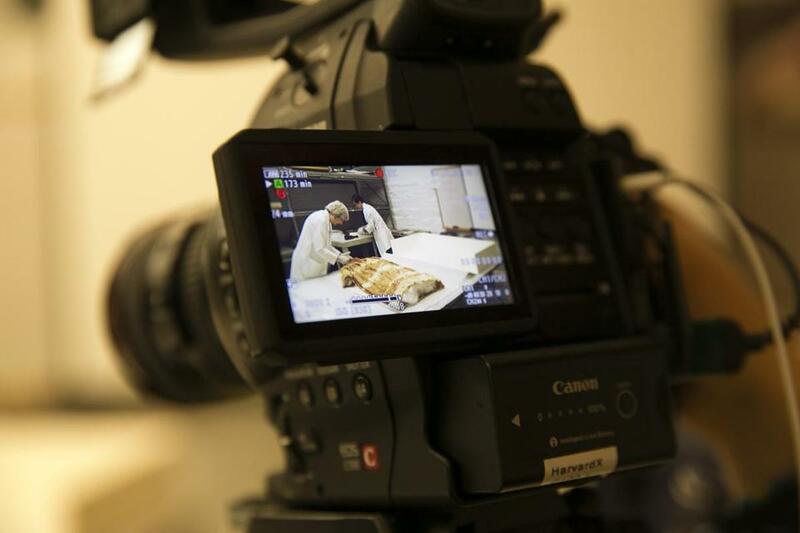 A videographer taped a conversation between Harvard Professor Laurel Thatcher Ulrich (left) and Christina Hodge, the coordinator for Academic Partnerships at Peabody Museum, for a massive open online course. Almost three-quarters of students who enrolled in the first year of online classes under a joint Harvard-MIT initiative were from outside the United States, demonstrating the global reach and growing popularity of the large-scale open courses. But only 5 percent of students who registered for courses through the online learning platform edX completed their class and earned certificates, although far more were involved in classes and reviewed much of the material, according to a new study by a research team from the two universities. The findings were included in a trove of data released last week that provides insight into the demographics of the students who use what are known as massive open online courses. Of the 842,000 students who registered for the free online classes offered by the edX initiative in the 2012-2013 school year, just 28 percent were from the United States. About 13 percent were from India, followed by the United Kingdom, Brazil, Canada, and Spain. The most typical edX student was a male with a bachelor’s degree who is 26 or older. But less than 1 in 3 students fit that profile, researchers found, suggesting there is a broad array of different types of students. Innovation Economy: Will MOOCs help you open career doors? For example, one-third reported a high-school education or less, while 6 percent reported they were 50 or older. Just 29 percent of the students are female, with predominately male enrollment in science, technology, engineering, and math classes. Most attrition happened soon after students registered. On average, 50 percent left within a week or two of enrolling. But after that, students were far more likely to stick with it. These open online courses “are reaching many nontraditional and underserved communities of students, very different from typical students on campuses at traditional universities,” said Isaac Chuang, a professor of electrical engineering and computer science at MIT. Such open online courses have exploded in popularity over the past two years, giving people across the globe a chance to take classes at world-famous universities. At the same time, many education specialists doubt their staying power, pointing to low completion rates as evidence that most students will not follow through on their own. Some students looked at every part of the course, others only read text or viewed videos, and others just took tests or completed problem sets. Many faculty members encouraged students to participate in the course however they chose, whether or not that led them toward a certificate, researchers found. A recent study by researchers at the University of Pennsylvania also showed that many students abandon classes shortly after they begin and that relatively few will see them through to the end. Of a million students in 16 classes offered by Coursera, a California-based provider of online academic courses, just 4 percent completed their courses, researchers found. Phil Hill, an educational technology consultant and analyst, agreed that completion rates are a misleading measure, given that many students know from the outset that they do not plan to finish. Students are also put off by the difficulty of the material, he said. Lawrence Bacow, the former president of Tufts University, dismissed completion rates as a “red herring,” given the wide range of student motivations. Since many online students have jobs and other responsibilities, finding the necessary time may be difficult, he added. So far, more than two-thirds of students taking online classes at Harvard and MIT have at least a bachelor’s degree, a level consistent with other such programs. Among edX students, several countries boasted above-average completion rates, led by Spain at almost 14 percent. Students from Greece, the Czech Republic, Hungary, and Poland also had strong rates. Completion rates also varied by course. Twelve percent completed a course on global poverty, while just 1 percent completed an introductory computer science course. In some courses, as many as 20 percent of students enrolled even though it was too late for them to earn a certificate. “That so many registrants register and participate in courses without hope of earning a certificate illustrates how limited certification and certification rates are at describing learning,” researchers wrote. • Will MOOCs help you open career doors? • Can you MOOC your way through college in one year?